This dish is prepared using orange peels, tamarind and other spices, and seems to be simply bursting with flavours. As children we watched adults who were about to eat an orange, and waited impatiently to grab the peels before they got discarded. We just loved to collect the peels for mother, who prepared a lip smacking gojju out of it. The peels of the oranges known as ‘loose jacket’ or ‘Kamala orange’ are the best for preparing this gojju. Though the peels can be sun dried and stored for future use, I feel that waiting for the season and using them fresh captures the unique flavour. 1. Soak tamarind for 10 minutes, and then extract the juice and keep aside. 3. When it splutters add fenugreek seeds and fry. 4. Add Bengal gram dal and roast till golden in colour. 5. Add asafoetida and red chillies. 6. Add green chillies and the fresh ginger slivers. 7. Now add the chopped orange peels and the curry leaves and sauté, then cover with a lid and cook in low flame. 8. After 2 minutes remove the lid and add turmeric powder and fry for a few seconds. 9. Add tamarind juice, salt, jaggery and sambar powder and boil the gojju until it emanates an aromatic flavour. 10. If you need it to be thicker add a paste of rice flour and water and simmer for a few minutes. 11. Finally add the roasted and powdered gingili (sesame) seeds and blend well. Relish this tongue tingling tangy aromatic gojju with rice, rotis or any other tiffin. Athithi Devo Bhava (Sanskrit) means a guest is considered an incarnation of God. Perhaps this is what drives the hospitality culture, a mark of an Indian home. Rising up to the occasion and managing an urgent need, is faced by every one in all walks of the day to day life. Indian homes, especially the kitchens, have proven this fact time and again by their hospitality in welcoming unexpected guests at any hour of the day, and serving warm, tasty, and filling meals. Once an unexpected guest landed at home after a three hour journey, and was in a huge hurry to attend a meeting. It was an odd hour, and there wasn't any meal as such readily available. Since there was no time to soak or knead or cook or steam, I opted to prepare this pesarattu with some green gram sprouts I had in the fridge. I first greased the tava and put it on slow fire. By the time I ground the sprouts with spice and salt, the tava was hot enough to spread the batter. The hot and crisp pesarattu was served on the table by the time the athithi freshened up and got ready to go. 1. Grind the sprouts with green chillies, ginger and salt into a batter. It need not be too smooth, and a slight coarse texture adds to the taste. 2. Mix in the asafoetida powder, chopped onion and coriander, and cumin seeds. 3. Grease the tava (pan) and heat it. 4. Pour one ladleful of the batter and spread it into a fairly thick circle. 5. Dribble oil all round and cook in moderate heat until crisp. 6. When it is cooked turn it on to the other side and cook for one more minute. Serve this with pickle, chutney, sambar, curd or even tomato sauce! This post goes to two events JFI Sprouts at Ammalu's Kitchen and Recipes for the Rest of Us at Ramki's One Page Cook Books. … and now finally for the round up of posts from Bloggers! Many bloggers have shared multiple treasures in their posts. We have tried to provide a flavour of what you can see at each blog here, rather than list every item on every blog! We strongly recommend that you visit all the blogs so that you don’t miss any treasures! Feel free to mail us, if we missed a major treasure category and we will surely update this post! The day doesn’t begin without a shot of caffeine! Let’s look at what gadgets some of our bloggers use for their beverages. Anu Venkat and VnV share how to make the perfect filter coffee! Jayasree, Cham and Priya Suresh treasure their filters too. Uma uses an Italian Coffee Maker for her cuppa. Ivy shares her Briki used to make Greek Coffee. Purnima uses a nifty battery operated blender to whisk up delicious hot and cold beverages. Happy Cook opened up her very unusual coffee filter for this event. She was thinking about throwing away this treasure! We hope all of us convinced her otherwise! Jai and Bee share their beautiful collection of coffee pots and creamers. Tetsubin tea pots from Japan, sake cups, a unique teapot made by their friend at a pottery class, and many more. Divya. M displays her very colourful set of designer teacups. You can find Shama shares tea cups, juice cups and soup bowls here. Aparna shares several of her traditional treasures, all well preserved such as the brass dough press, urali ,kal chatti and mathu! Check out her appakaaral, where you can still see her grandfather’s initials inscribed! PJ has a lovely post and brings her kuzhi paniyaram pan made of soap stone, kal chetti, eeya chombu, mathu, and the traditional old brown and white porcelain pickle jars. She also shows us how to use a Kumutti or traditional stove. Thanks to her father for clicking all these treasures for the Hunt! You can see another Kumutti here, and porcelain pickle jars here. Jayasree shares her idiappam press, iyya chombu and uruli as well. 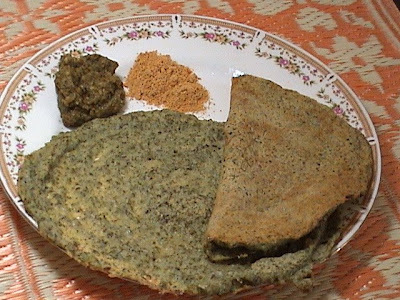 Shama shares her Paniyaram pan and a variety of other gadgets at her blog. Read Chitra Amma’s explanation on eeya chombus here! Who says only appams and paniyarams can be made in appakaarals? Take a look at Mamatha’s Japanese Takoyaki Nabe, which are actually used for … I know this is a veggy site …octopus dumplings! Happy Cook on the other hand cooks snails in garlic butter in this French Escargot! Now for moulds, presses and squeezies of all kinds. Pallavi brings treasures from Telangana. Gavala Peeta and Kariyali Peeta help provide designs of sweets and savories. She also shares her Boondhi Jalli Ganta and Murukku Press. Priya Suresh also shares her grandmother’s idiappam press. Chitra Amma has a different kind of idiappam press. Divya M shares her muruuku press. Happy Cook brings for us a traditional Kerala Achappam or Rose Cookie Mould! Cham shares two types of murukku press – both old and new, a boondi tray, and idli trays of different dimensions! Lakshmi grumbles about the thickness of her cast iron rotti pan! Check the thickness here! She still manages to turn out a mind boggling array of rottis if you’ve been following her blog! You can see few more cast iron rotti pans from Srirangam here. Don’t we all have our favourite spices. How wonderful to have all of them in one large box, with tiny spoons as well! Check out Rajeswari's Aindu Arai Peti. Shama has a set too. Here is a menacing looking koduval! One powerful blow is enough to crack a coconut! Jayasree also shares her chirava to scrape coconut. Here is Uma’s favourite mandolin and Cham’s coconut scrappers. Shama shows us this very different type of coconut knife. Her Aruvamanai looks very comfortable too, with a small built in bowl to hold cut veggys or coconut. Now for all kinds of pounding, dehusking and winnowing gadgets! Ivy’s Goudi and Goudoheri from Cyprus is made of bronze! 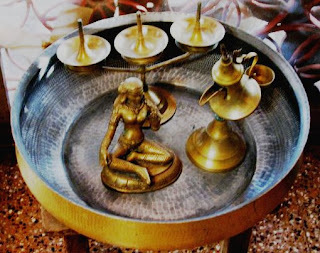 Aparna’s from Kerala is made of brass. Priya Suresh’s is made of granite. Yosee shows us the Kobek and Ulek from Indonesia , as well as Ketugan which requires 4 to 5 people to pound and dehusk paddy! She also shares a tradional Indonesian winnow. 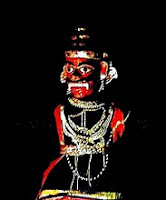 Cham's Muram is made of cane and now decorates her wall, and Priya's muram is made of steel. 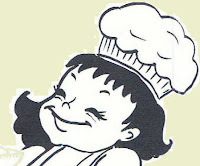 Our favourite Steamers have got to be the Cooker. Sangeeth shares her electric, as well as pressure cookers . ‘Ibu’ or ‘mother’ is the way Indonesian House Keepers are addressed, and Yosee says her Ibu would not manage without a this Dandang,! While many of us use the pressure cooker for rice idlis and rice. Divya M brings a steamer especially made for idlis, and a vessel she uses for boiling and draining rice - Vadicha Saadam Paanai. Here is Rajeswari's idli steamer. Navita shares a Dimsum Steamer plate she bought at Hong Kong. You can find cake decoration equipments (and cakes!) as well as a doughnut maker, at Ramya's blog. Uma loves her steel, and her collection has traveled with her across three countries. 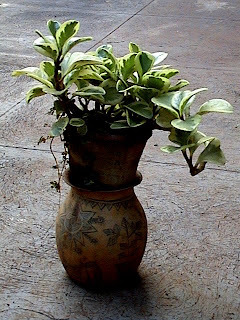 Shama shares her collection of steel pots as well. Priya Suresh shares her husbands favourite beer mug, and a welcoming French Soupiere. She also shares a 'common-but-not-so-common-nowdays’ 3 rung steel Tiffin Carrier! Ivy shares a Tsestos from Cyprus, a colorful shallow cane basket to keep bread. Navita was in a dilemma on what to take and not, when she traveled to Hong Kong. She ensured she carried a Kolkata Sadsi, Chimti, Belan, Dal Ghotni , a Pressure Cooker, and not to forget her Chalni! She uses her Chalni for purposes other than sieving and you can read her post for details! A chalni is called a saladai in tamil. Take a look at Shama's saladai. Ramya has a whole lot of kitchen gadgets that her kitchen came equipped with, and we don’t know the uses for many! She had made a slide show of all of them. Drop by her blog, and let her if you know what is for what! This brings us to an end of the round up, and many hours of interesting blog hopping! This event served another purpose for us as well! It opened our eyes to the world hunger problem. Ivy and two others bloggers have begun an online community of Food Bloggers, to spread awareness about hunger and make a difference by some positive action. When you visit her post for Treasure Hunt, you will find the community. While we have participated in school fund raisers and so at some point in time, it was for the first time that we actually did some reading up of facts on world hunger. We felt really bad that India contributes to 50 % of the problem! Well, irrespective statistics, hunger and starvation at any place is appalling. Do join the BloggerAid community and participate. Play the 'Free Rice' game (see left had column of this blog) as often as possible. Contribute food when scouts and guides come to your place for the cause. Next time you celebrate at home, just make some more food and take them to the needy in your neighbourhood. We Foodies love our food. We can appreciate what it is to be deprived of even one meal. We can collectively make a difference! A big Thank You, to all those who shared your treasures. This is the first time we are doing an event, and expected few participants. Suddenly on the last two days we received so many more! We now have 21 entries from bloggers and 2 from non-bloggers. It has been an amazing time reading all the posts, and we did indeed discover so many treasures, not only from India, but also Indonesia, Japan, France, Cyprus, China. We have few antiques, traditional utensils, unusual one of pieces, as well as a few modern gadgets as well. This is also the first time we can fully appreciate the efforts by fellow bloggers, who host events and do lovely round ups! We had a number of photos from the non-bloggers, and didn't want to leave out any. We found that doing one mega round up with with the capabilities of Blogger daunting. We therefore, decided to do two posts. This round up consists of entries from Non Bloggers. Part 2, will have the entries from bloggers. Let us first take a look at entries from Shivashankari and Guhan. This young Bangalore based IT couple, do a lot of globe trotting, with gigantic cameras and photography gear slung around their necks! You can see some of their marvelous photos of a recent trip to Cambodia at my links. The treasures below including the ‘Guess What?’ were sent in from Shankari’s parents home in Chennai. For those who attempted the “Guess What?”, this is not a giant ear scraper or back scratcher! This is a 'shillu katthi'. It is, as some of you have correctly guessed, to do with a coconut, but not for grating! Notice how thick and heavy the handle is. This side is used to crack the coconut, while the other flowery end is used to pry out the kernel. This is a quaint looking ‘aruvamane’ or vegetable cutter. It is held steady, by placing a knee on the wooden board. Vegetables are then held with both hands, and slit against the sharp vertical edge. The serrated tip is used to grate coconut. This arvamane has decorative etching at the base. Tenkuzhal is dough that is squeezed into ribbons and deep fried to make a crunchy savoury snack. This one a is 'tenkuzhal nazhi'. This on the other hand is a 'sevai nazhi' or a 'string hopper press'. Its a difficult task pressing strings through these perforations! You can see another type here. The second non-blogger entry is from Malini and Savithri. They are from a joint family in Mysore, have a sprawling garden, and usually grow their own vegetables and fruits. They still use many of the traditional equipment in their daily lives. Those which are no longer used, have been creatively utilized in landscaping and interior design as you can see below! Removing the husk from a coconut is not an easy task as can be seen here. Savithri’s husband is an engineer who designs and fabricates innovative machines and tools. He has fashioned this tool so that the coconuts from the garden can be dehusked easily by anybody. The coconut is impaled on the tip and held firm, while the lever is turned to separate the thick fibre. It is one of a kind, and that's why it does not have a name! Doesn't the first photo look like a robot straight out of Star Wars ? This is a very old traditional coffee bean grinder. It needs to be clamped to a surface and then used. Roasted coffee beans are freshly ground, after which the powered is used to make filter coffee decoction. More on coffee filters in part 2. This simple equipment is a called an 'aduppu' or 'choolha', and can be used to light a fire for cooking. 'Ammi kal' and kuzhavi, 'beesora kallu' and are used for grinding, powdering and so on, and are now used so innovatively to adorn their garden! Take a look at the pictures of the ones that are still in use at these links. Beesora Kallu – used for grinding rice, ragi, wheat and so on, to make flours. In the days, when water was drawn manually from the well, this large trough was used to store water to wash vessels. This has now become a safe sanctuary for seedlings, before they are big enough to be transferred to the ground or to pots. The iron 'bandli' or pan was used for frying sweets and savories for large joint families. This has easily lent itself for a small rock garden! The largest vessel is called 'Gangalam', again used for large scale cooking. The one inside is a 'Kodam' used to store water, the one behind the Buddha an old 'Ola Koodai' or a straw basket. Yet another large vessel decoratively used. This is definitely not a cooking gadget, but a real friend in ancient kitchens, and hence it is in here! As many of you know, this is a old rat trap. This one is closed, but rest assured no rat inside! A 'Yelli Koondu' was a must in the 'ugrana ul' or storage room, where sacks of rice, lentils and all provisions were stored, and an easy target for mice and rats! That's all for Kitchen Treasure Hunt - Part 1 folks! Hope you have enjoyed browsing this post, as much as we enjoyed posting it! Look out for Kitchen Treasure Hunt Round Up – Part 2 for all the treasures from bloggers! Aval or Beaten Rice, is not only easy to prepare, but very tasty as well. However, old timers consider offering Aval Usili to a guest, as an insult! My sister-in–law’s mother-in-law prevented the cook from preparing Aval when we visited them. Though I explained to her, that we loved the dish and that we often prepared it at home, the grand old lady was very firm. She did not want us – the sambandis (inlaws)- to have the ‘ humble’ usili at her place and that was that! Aval is devoid of fat and cholesterol. It makes an excellent ingredient for light evening tiffin. Although it is quite filling, it gets very easily digested, and does not affect the appetite during dinner time. Puli Aval (Tamarind Aval), Elumcham Aval (Lime Aval), Tenga Aval (Coconut Aval), Masala Aval (Aval with onion and potatoes), Tomato Aval, Milagu Aval (Black pepper Aval), and Vegetable Aval are just few of the different types of Usilis that can be prepared, with this ingredient. Among all the Avals, the Patani Aval (Green Peas Aval), has been voted as the best by my grand children. 1. Wash the beaten rice two times and drain. Squeezing is not necessary. 2. Let the wet Aval stand for about 20 minutes, till it resembles cooked rice. 3. Heat oil in a pan and add the mustard seeds. 4. When mustard seeds splutter, add the two dals and roast till golden in colour. 5. Add the asafoetida powder. 6. Add the broken red chillies and fry till crisp. 7. Add the curry leaves, and then the green peas and salt. 8. If you are using frozen peas, cover with a lid and let the peas cook on low fire. 9. Next add the soaked Aval and blend well. 10. Cover and cook on low heat for two minutes. 11. Remove lid and stir well to break up lumps if any. Enjoy the simple, tasty and hot Patani Aval . My grand children on their return from school, enjoy it with a cup of thick curds, over Tom and Jerry cartoons! TIP: The hard variety of Aval is best for this recipe, as the grains in the dish should be separate from each other, and should not stick or form lumps. The hard variety is however not available everywhere. While using soft variety, a quick rise under cold running water is sufficient, else the aval will quickly become slushy. Also, avoid covering the dish while cooking, and keep it on low heat for a longer time, to get rid of the moisture. Avoid stirring too many times. Use a flat ‘chappati’ turner ladel and gently mix. Even as we were yakking away on Skype, we remembered that we had told Mansi we will take part, in the Vegan Thanks Giving event! We just realized that there is less than 3 hours left (in the West Coast US!) for the deadline! And so ...Amma rushed off to prepare this delicious dish for a Bangalore breakfast, while I wrote out this recipe in Sydney. Even as I completed writing, my dad, the ever enthusiastic photographer mailed me a click. So here is our recipe for the Vegan Thanks Giving Event at the Fun and Food Blog! Yummy dish in a flash! 1. Heat oil, and add jeera. 2. Next add onion, and ginger. 3. Reduce the flame and fry until onion is caramelized. 4. Now add the tomato, salt and Sambhar powder, and stir well. 5. Cover the pan tightly with a lid. 5. Keep opening the pan time and again to stir, and ensure the mixture does not burn. 6. Once its cooked well, you will have a brilliant red tomato paste, and the oil will come out of the masala. 7. Mix maida with a little bit of water, and add to the pan and fry. 8. Now add the corn, and sautee. 9. Next add a cup of water and stir. 10. In a minute the corn will cook. Switch off once you have the consistency desired. 9. Garnish with fresh coriander leaves before serving. Instead of Sambhar powder, you can use chillie powder and garam masala. 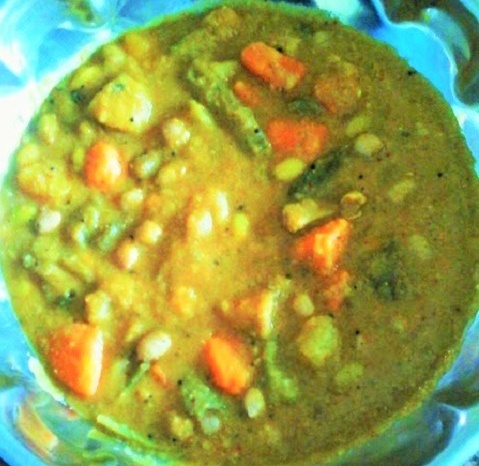 However, Sambhar powder makes it a different and tasty adaptation. The sambhar powder we use, is a simple recipe, and we use it as a 'universal powder' for not only Sambhars, but also Rasam, Currys, Sabjis and Poriyals! This curry is a favourite dish with bread, chappatis, dosas, even palav and fried rice! It has been scientifically proven that cooking multiple ingredients together collectively, provides more nutrition to our body than cooking any one ingredient at a time. Cooking multiple vegetables, or a variety of lentils, or using different cereals together is recommended by all nutritionists. The super markets are flooded with items like multi grain bread, multi grain breakfast cereal, and recently in India there are even multi cereal flours available for preparing rotis and chapattis. 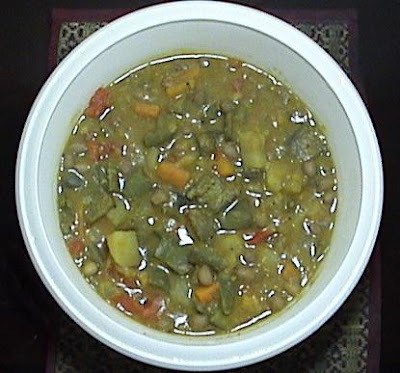 YEZHU KARI KOOTTU is a traditional dish prepared by using seven types of vegetables and lentil since times unknown. The commonly used vegetables for this koottu are ash gourd, pumpkin, brinjal, yam, potato, snake gourd, chow chow, cluster beans, flat beans (avare kai), field beans, french beans, carrot and so on. The list is endless. When a variety of vegetables are united in harmony, their nutrients complement and enhance each others value and fortify the body to withstand the attack of unknown terror striking viruses, which try to destabilize our body. Salutations to our Mother Earth, for producing numerous vegetables of different species and different classifications, which when united, and utilized wisely will nurture and protect us from any viral assault. Note: These are the vegetables I used in the preparation of the koottu in the picture. 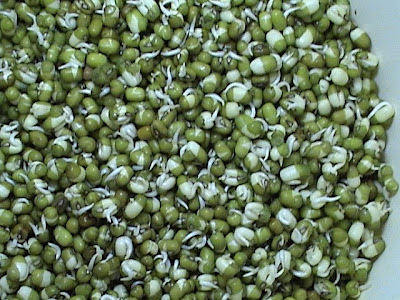 Substituting field beans for ground nuts is usually favoured. You can combine any or every vegetable of your choice and you need not restrict to just Yezhu (7) kari (vegetable). 1. Pressure cook dal with turmeric powder adding 2 cups of water. 2. Heat ½ tsp of oil and add the coriander seeds, bengal gram dal, black gram dal and the red chillies and roast till it turns golden in colour. 3. Add the asafoetida and fry for a minute more. 4. Now add the fresh coconut gratings, and fry for two more minutes and turn off the flame. 5. When the roasted spice is cool enough, grind it to a paste adding water little by little. 6. Cook all the diced vegetables in just enough water. 7. Heat one tsp of oil and add mustard seeds and curry leaves. 8. Add the cut capsicum and sauté for 2 minutes and add it to the cooking vegetables. 9. when all the vegetables are done, add the cooked dal and salt, and bring it to a boil. 10. Now add the spice paste and chopped tomato and allow it to boil for two to three minutes. 11. When the pleasant aroma of Yezhu kari koottu emanates, switch off the flame. and relish it with rice or chapaties and enjoy the wholesome nourishment. The terror strikes in Bombay, left everybody dead or devastated. The human mind is interesting. Even as we see the media and politics play out, we all know that we the citizens need to assume responsibility, and we do something about it. Yet, we are in a helpless state, and lack any direction on what exactly can be done. Some folks started signing signature campaigns. Some lit candles. Few Facebook communities wore white on Monday. Somebody even came up with the idea of collecting a rupee each to rebuild Taj! (Oh, for heavens sake!!! How does that even remotely address anything!!??). For some reason, we felt automatically propelled to cook this dish. Perhaps for all the symbolism it provides... Perhaps because we don't know what else we can do...Perhaps because food touches us more than anything else at a primal level. Symbolic actions cannot wipe terrorism away or bring security. At best they are only symbols.